I was sitting close to the field near a corner of Fisht Stadium. Greetings again from Sochi. It's kind of busy here (men's downhill starts shortly), so I don't have much time to write. But here are a few shots from my four hours inside Fisht Stadium for the Opening Ceremony on Friday night. And a few other sights. 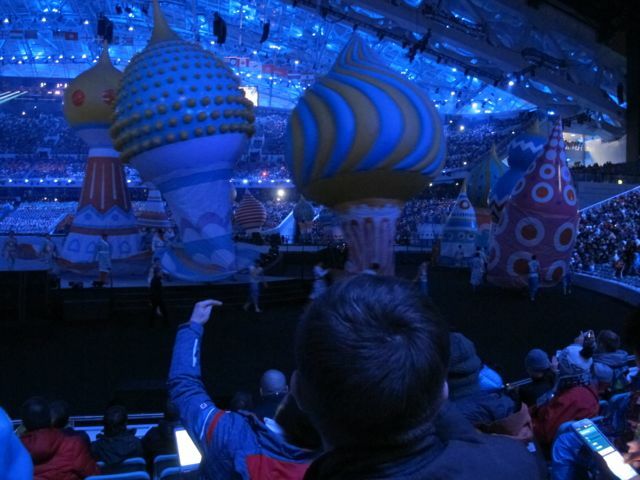 We got a close-up look at the inflatables, among other elements of the show. This apparent anti-Russia protester from the former Soviet republic of Georgia kept holding up a placard bearing the name of the capital of the disputed region of Abkhazia, which Georgia claims but Russia controls. No one stopped this man from waving his sign. The anamatronic mascots looked great in person; hope that came through on TV. 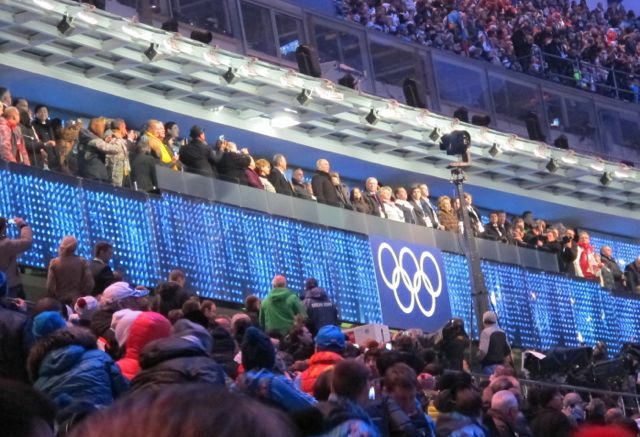 Here's how close we were to Putin (center of photo). Here's Vladimir with IOC president Thomas Bach on the left. We interviewed Bach before the Games and I like him. The hockey-playing constellations—former Minnesota North Stars?—were, I felt, a Naturalist's Notebook-y touch. At several points in the ceremony, the fake snow was falling pretty hard. It seemed to be made of soap or something. The weather inside the stadium was quite cold, so the snow seemed real. Russian TV may have doctored its broadcast so that viewers would think all five Olympic rings opened, but this was the reality: only four, with what looked like an asterisk. These whirligig costumes were simple but brilliant. This is what my press ticket looked like. Only a limited number of journalists from each media outlet were given tickets to attend. Everyone in the stadium had to wear one of these lights, which flashed different colors at different moments. 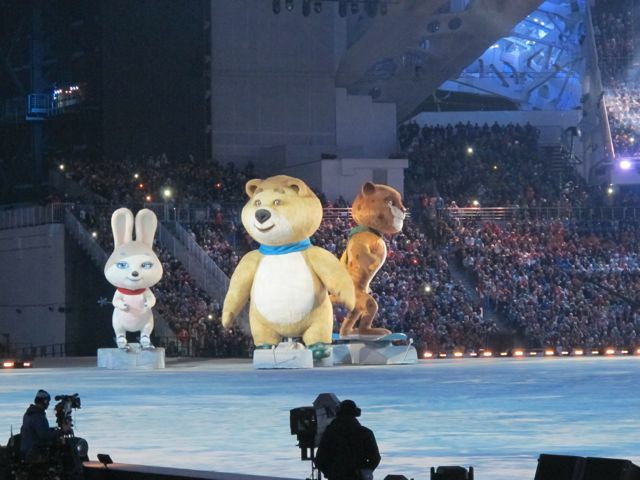 Each bears the words Participant 2014 Olympics. 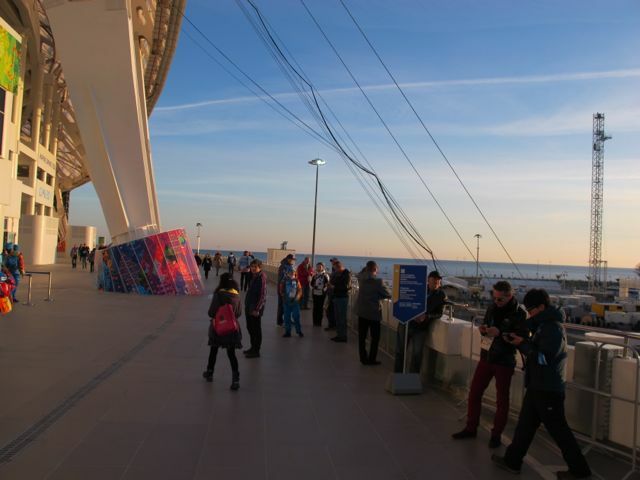 I took this shot before the ceremony to show how close the stadium is to the Black Sea. True to the half-built spirit of these Games, the Main Press Center sprung a leak right above the desk of Frank, our techie. He put up a makeshift roof. Meanwhile, one of our writers was trapped in his fifth-floor hotel room for several hours yesterday morning when the door handle pulled off from the inside and no one was at the front desk to come up and let him out. Perhaps you've seen the photo of the Olympic Village bathroom door a U.S. athlete kicked his way through in order to escape in a similar situation. 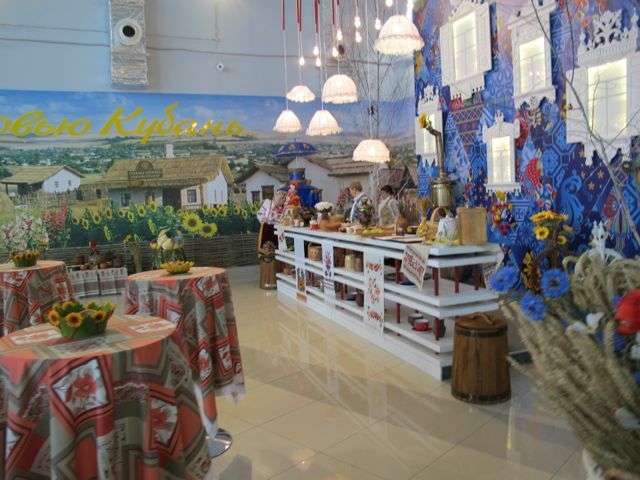 Back at the Main Press Center, costumed local women have been serving black tea that's grown in Sochi on the world's northernmost tea plantation. A few minutes ago I scored a rare Kazakhstan pin. Given the news that the country's autocratic leader is considering dropping the stan from the end of his nation's name because he's tired of his land getting confused with other, in his view, inferior countries that end in stan, this pin could become a collector's item.